Tetratec, in our eyes is a good, solid and premium brand of fish keeping product, this is no exception with their range of HT heaters. 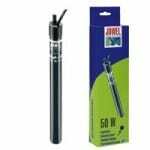 Within the range are 5 heaters with wattage values of 50W, 100W, 150W, 200W and 300W. As you can tell from our guide to what wattage heater you require in an aquarium, their range covers most bases and sizes of aquariums. 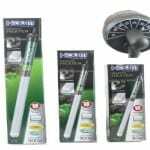 After much use on various types and sizes of fish tank we have found the Tetratec aquarium heaters to be reliable precise and easy to use aquarium heaters. Tropical freshwater and marine fish require a stable temperature of around 24-27 degrees Celcius in order to remain healthy and in good condition. The TetraTec HT range of heaters maintain a constant temperature via an inbuilt thermostat making it easy to provide the correct conditions. Take a look at our Tropical Fish Profiles for more fish specific details on required temperatures for keeping and taking care of fish in the home aquarium. 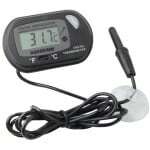 Easy to set temperature control allows adjustments of 0.5C within range of 20C 32C which should suit every aquarists needs. 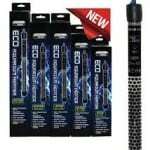 The Tetratec Aquarium heater also comes with a generous extra long 2.5m mains cable for easy fitting. Should you be performing a water change or water levels drop below the heater, the Tetratec Fish tank heater features a safety device which will turn the heater off if accidently run dry, although it might not sound like a big deal, trust me when I say you do not want a heater to smash inside your aquarium as clearing broken glass up from the substrate is not fun! 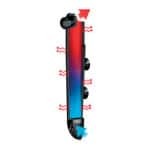 The fish tank heater can be fully submerged and positioned horizontally or vertically giving you freedom to position how and where you want it within the tank. Electronic regulator for extra relability and safety as well as extra thick heat resistant borosilicate glass for peace of mind really sets the gives the Tetratec product the premium brand recognition it deserves. To us this heater you simply attach your TetraTec heater to the side of the aquarium using the enclosed rubber suckers. The heater should be fully submerged. Then set the temperature dial to the desired setting and turn on the power. The indicator light will illuminate when the heater is in operation and away you go. 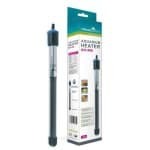 Go for the Tetratec HT aquarium heater if you want years of reliable and peace of mind aquarium heating form a solid reliable brand. The 1967 James Bond Film, ‘You Only Live Twice’ starring Sean Connery showed a woman being thrown into a Piranha Pool!